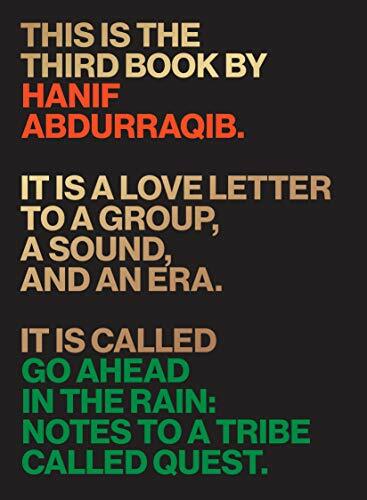 Who is Hanif Abdurraqib? And what does the subtitle of his book really mean? In fact, he’s an African American intellectual who writes about music, and also a guy from the hood who can talk hood lingo. In a black-and-white photo Abdurraqib wears a cap backward. He has a beard and a mustache. The text on his jacket reads, “Ohio Against the World.” (Mr. Abdurraqib is from Columbus, Ohio, and he’s not a lone dissident). A Tribe Called Quest is the peg that Abdurraqib uses to hang his ideas. Indeed, Go Ahead in the Rain is all over the place and with great ease. The author writes about slavery, drums, drumming, jazz, Afrocentrism, the New York Knicks, rap, Rodney King, success and failure, Tupac Shakur, Otis Redding, the Grammy Awards, and much more. Some of the subjects he writes about are predictable. Others less so, even surprising as when he talks about African American mothers, Leonard Cohen’s life and lyrics, and about magazines such as Jet and Ebony. What holds all the desperate elements together is Abdurraqib himself. Go Ahead in the Rain is a musical memoir in which the narrator comes of age and becomes a man. Abdurraqib is insightful about sibling rivals, cool, un-cool, and the gap between the two. “There is a lot of currency in the space between immensely cool and not at all cool,” he writes. At one point in his memoir, the author suggests that he was nerdy. That’s hard to believe. In Go Ahead in the Rain, he seems immensely cool. His book reads in part like a nifty advertisement for himself, though he may not need to promote himself as much in the near future as he does now. In 2020 Random House will publish his book, They Don't Dance No' Mo'. Abdurraqib is going places. In fact, he already has, as Go Ahead in the Rain manifests. A portion of this book was previously published in a literary magazine. In that portion, which represents some of the very best writing in the book, Abdurraqib observes, “We are maybe each other, through two different mirrors.” At times, he can be deep.